This giggling friend will get baby laughing too. 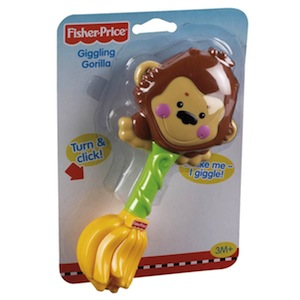 At the top of the rattle is a friendly gorilla with a giggle stick inside. There is an easy to grasp handle for baby in the center, and at the bottom is a bunch of bananas that click when baby turns it. 3 months and up.